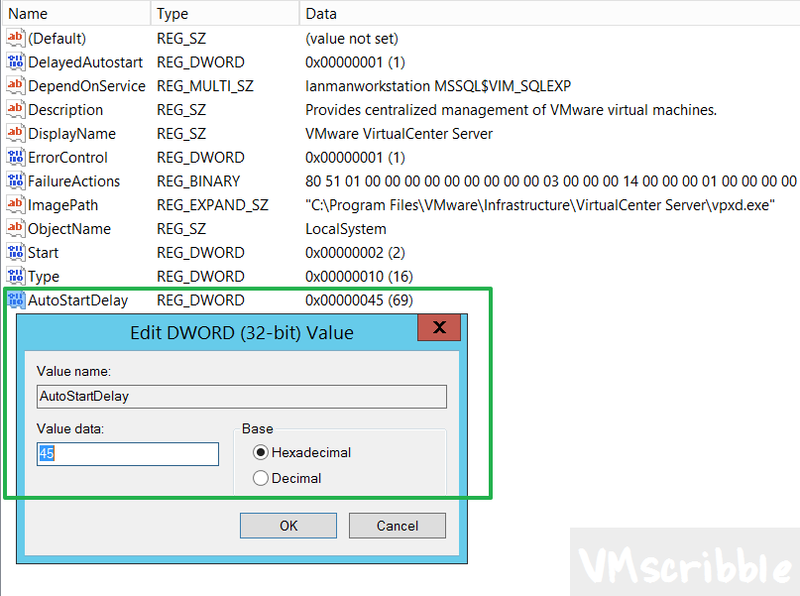 Out of the box the VMware VirtualCenter Server Service (vpxd aka c# client users) is delayed for 120 seconds in Windows. I am running Windows 2012 R2 and vCenter 5.5 u2/u3. The goal is to lower the start time of the service after an OS reboot. 45 seconds is just enough time to allow all of the automatic windows services to start; you can experiment with lower numbers. Side note- HKEY_LOCAL_MACHINE\SYSTEM\CurrentControlSet\Control\ Adding AutoStartDelay applies for ALL delayed services; we just want the single delayed service.